Dr. Emad Shahin was honored for his prolific academic and intellectual life. 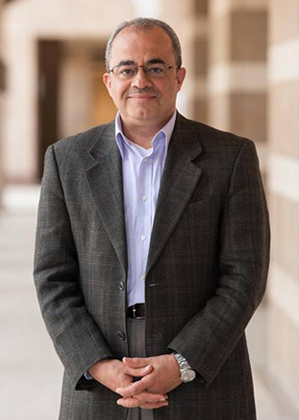 He is currently on leave from the American University of Cairo and a Visiting Professor at Georgetown University’s School of Foreign Service and a Distinguished Visiting Scholar at Columbia University. IIIT honored him for his political courage and public engagement as well as his scholarly work. His commentary in media and numerous forums are a testimony to his honesty and deep engagement and commitment to the principles of justice, freedom and human rights. He has also made personal sacrifices in his journey to uphold these key virtues. This honor is a small contribution to say thank you to Dr. Shahin for his lifetime academic achievement and public engagement. Dr. Shahin thanked IIT and discussed how his relationship with IIIT started nearly 30 years ago. IIIT influenced him in his subsequent writings, for the reform of Islamic Thought was at the core of his research. Dr. Shahin reminded us that the challenges of today and the direction where the Muslim World is heading require us to shift our examination of the state, to instead, examine the human being. This would thereby make the human being, and not the state, the core of Islamic intellectual activity and for this effort we need a creative framework. Muslim society needs courage, moral activists to go against the hegemonic powers in society.